Kyle Howe will be the first to admit that his marriage proposal to longtime girlfriend Eva McMillan didn’t quite go as planned. 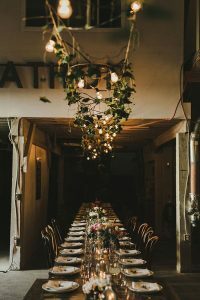 But when the pair tied the knot in April, the reception went off without a hitch thanks in large part to the deft touch of Railtown Catering’s Events and Marketing Manager Marli Anderson. It was last December in frigid Montreal when Kyle and Eva were visiting friends that Kyle hatched his plan to pop the big question in front of the house where the two first met as part of a beer-drinking team back in their collegiate days. He roped in a friend to casually drive by the house and another to wait nearby with a bottle of champagne and two glasses. However, all’s well that ends well. They eventually arrived at the appointed spot, Kyle got down on one knee and Eva — who admits that she began to get an inkling something romantic was afoot when they approached the house and Kyle began waxing poetic about love — tearfully accepted his offer. Even the champagne eventually appeared. With the proposal out of the way, it was time to turn their attention to the wedding and reception. In keeping with their desire to showcase the many breweries, restaurants and artisans that lend an authentic and eclectic vibe to the East Vancouver neighbourhood they now call home, Kyle and Eva turned to the event-planning experts at Railtown Catering. Much like the couple themselves, it was an ideal fit at first blush. 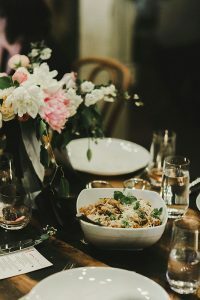 “I used to cater at a high-end facility in Massachusetts and I found that catering can be very cookie-cutter and a lot of companies — ironically — won’t actually cater to what you specifically want to do. But when we started talking to Marli, she was excited and interested in helping us develop something really unique and that was so appealing to both of us,” said Kyle. 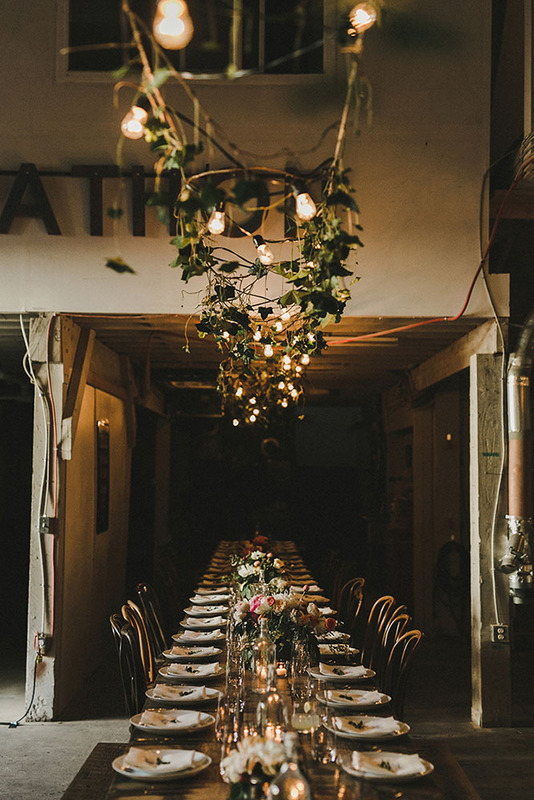 For their intimate ceremony and reception, which was held April 30 at Union Wood & Supply Company in the Clark Drive industrial district, Kyle and Eva asked Railtown to design, deliver and serve an unforgettable, gourmet family-style meal. Railtown’s talented team of chefs began with a salad course consisting of both Purple Watercress Salad with heirloom carrots, fresh goats cheese, candied almonds and a white balsamic dressing and a Baby Kale Salad with shaved apples and fennel, crispy squash and a sherry vinaigrette. For dinner, Railtown rolled out all the stops with platters of Whole Fraser Valley Chicken with wild mushrooms and creamed baby leeks and Madeira jus, Pan-Seared Salmon Fillet with braised savoy cabbage, shaved radish and riesling beurre blanc and Rigatoni Pasta with roasted Mediterranean vegetables, San Marzano tomatoes and basil pistou. Quite unlike the initial proposal, the reception was smooth as silk. 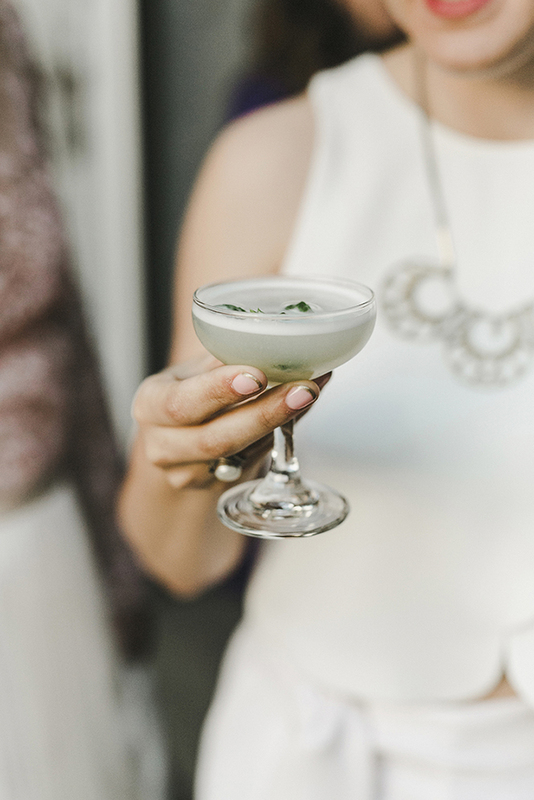 For more information on Railtown Catering or to book your customized wedding-day celebration, call 604-568-8811 or send an e-mail to [email protected].